Gran Canaria is one of the Canary Islands, an autonomous region forming part of Spain and, therefore, of the European Union. As it is a fully integrated territory, the applicable legal system is that of Spain and the European Union. Moreover, its own special Economic and Fiscal system, entirely compatible with European regulations, offers reduced taxation on company profits and on consumer goods as well as access to other incentives to business investment. Canary Islands Special Zone (ZEC) Businesses set up within the ZEC are subject to a reduced level (4%) of company tax. This option is particularly attractive to investors from other countries as no withholding tax applies to repatriation of dividends nor on the payment of interests to their headquarters. Customs-free zone. In this zone goods can be stored, transported and handled during an unlimited period of time without having to pay any type of import duty or tax. Indirect Canary Islands Tax (IGIC). 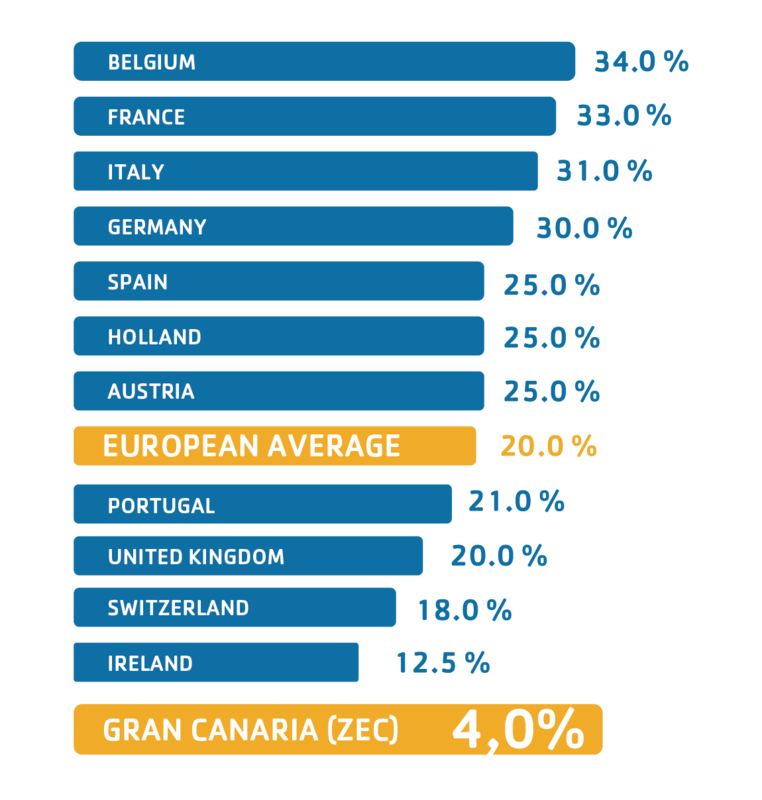 This is similar to VAT but specific to the Canary Islands, with notably lower charges. Its standard rate is 7%. Special taxes. Taxes on alcoholic drinks, tobacco, fuel and certain modes of transport are significantly lower than in the rest of the European Union. Business investments made in Gran Canaria are eligible for subsidies and other national and regional financial instruments aimed at financing productive investment, RD&I, environmental improvements, training and recruitment.